The Business requirement was to provide a credible health service to customers with choices at their fingertips. The primary challenge was to provide a powerful search engine. A key issue was to port a skeleton running application to a new technology, in the shortest possible time, without impacting customers and thereafter add features. A friendly admin interface was needed for the User to add Doctors, Hospitals, Diagnostic Centers on their own. Interactivity was required to allow end-customers to engage with health providers. Extensive interaction with business owners. Ruby on rails framework was selected to meet the extremely short deadline. Balsamiq mockups of solution were made. 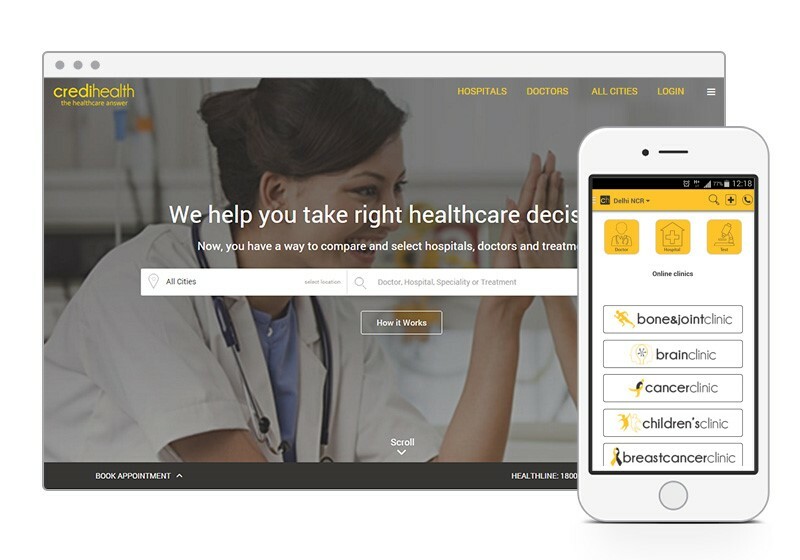 Search and compare Doctors and Hospitals and book appointments. Get comparative quotes for a procedure from different hospitals. Credihealth was able to launch the new application very fast, without impacting its end customers. After North India, the business was able to expand their services to include Mumbai. Credihealth was able to aggregate Users to offer them maximum discounts and additional benefits.